New figures in the UK, show less than a fifth of young people have received the MenW vaccine so far this year. School leavers, particularly those going to university or college this month, are being strongly encouraged to get vaccinated against meningococcal disease after figures released today showed less than a fifth of young people have received the vaccine so far this year. Last month, Public Health England (PHE) advised all school leavers, but especially ‘freshers’, to get the jab from their GP to protect against this potentially deadly disease. By the end of August, only 17% of all 18 year olds leaving school (not just those going on to university) had been vaccinated, according to data from GP surgeries. PHE is targeting new students who are at greatest risk because they mix closely with large groups of new people, some of whom unknowingly carry the bacteria, enabling it to spread more quickly. With freshers’ weeks about to get underway, PHE is renewing the call for teenagers to get this highly effective, potentially life-saving injection which protects against group W meningococcal disease (MenW). They can get their jab from their GP, either at home, or where they are studying. In recent years, there has been a sharp increase in cases of this highly aggressive strain of MenW, with one in 10 cases resulting in death. In 2009 to 2010 there were in total only 22 cases in all children and adults, but this rose to 209 in 2015 to 2016, up from 176 the previous year. MenACWYvaccination of school leavers was introduced last summer, and a slight drop in cases has been seen among those aged between 15 and 19 (in contrast to other age groups), falling from 25 last year to 20 this year. The total number of deaths, across all age groups, has risen from around 4 a year up until 2012 to 22 deaths in 2014 to 2015. Survivors are often left with life-changing disabilities like hearing loss, brain damage and loss of limb. The vaccine not only protects those vaccinated, but it helps control the spread of the disease in the wider population. PHEhas been working with higher education institutions and meningitis charities to raise awareness of the vaccine, with new students being targeted at freshers’ fairs, student unions and in halls of residence. We’ve introduced this vaccine because of a rapid increase in cases ofMenW across England, with new students particularly at risk. This vaccination is highly effective and can save lives and prevent devastating, lifelong disability. It’s only a month since we first made our appeal to these teenagers, so we know many will still be making arrangements to get vaccinated. But I strongly urge those who haven’t done so to get their injection now. 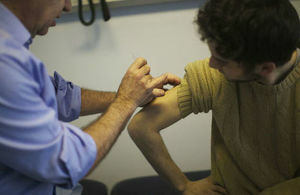 If you’re not registered with a GP yet at university, get registered and get your jab. New students should be alert to the signs and symptoms and should not wait for a rash to develop before seeking medical attention urgently. Students are also encouraged to look out for their friends, particularly if they go to their room unwell. In the first few days of university, exposure to the bacteria that cause meningitis increases dramatically. It is vital that new students get this vaccine now to protect themselves and to stop the spread to others. Recognising that students are about to move their universities of choice means that their chances of getting vaccinated at their home GP may be lost; this doesn’t mean they should forget about it. The vaccine is available via the university health service, it’s still free and it should be a priority. I would call on young people not to miss out on a vaccine that could save their life. Source: PHE infections press office.